Joanna Wiebe, famed copywriter for brands like Neil Patel, Crazy Egg, Buffer, Shopify, and many more, joins Julia for a guest expert interview discussing her background in copywriting, how "conversion copywriting" came to be a term, the three pillars of conversion copywriting, how she boosted Crazy Egg's home page ROI by 8%, and much more. Does SEO even fit into her world of conversion-oriented online copy? 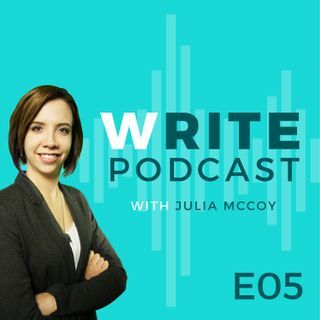 Find out in this episode, where Julia interviews Joanna all about ... See More copywriting. See more: expresswriters.com/writepodcast. Follow Julia's Write Blog at: expresswriters.com/blog.